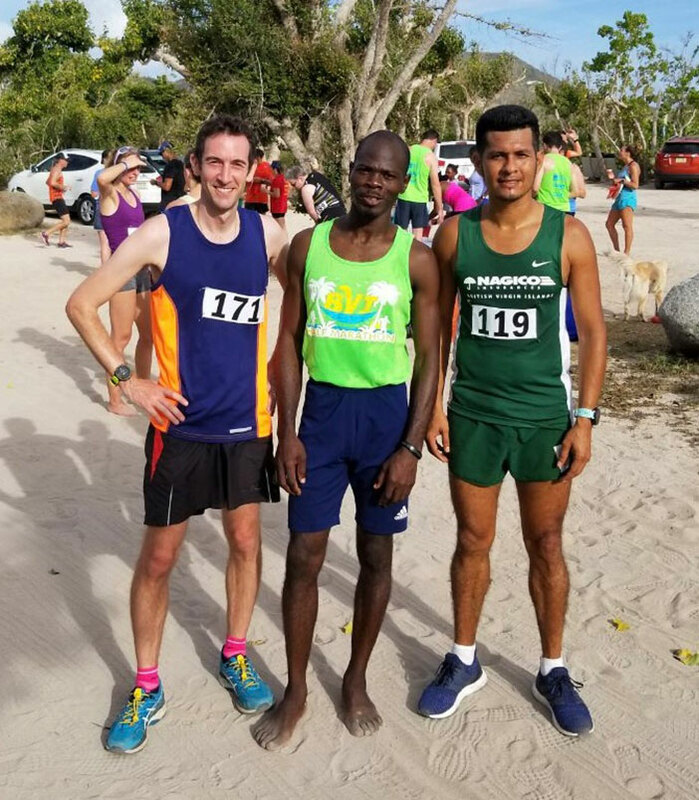 Like many in the field of 47 runners in Saturday’s race who also competed in the Torture, Julius Farley wasn’t sure what to expect or how his legs would hold up, as he spent the week recovering from the hardest race of his life. Farley, who won the opener of the Hauteville 5K Series, skipped the second race to focus on last weekend’s KPMG Tortola Torture, where he was third overall. In Saturday’s race, Farley broke away from Reuben Stoby to win the Beef Island race in 18 minutes and 18 seconds, with Stoby finishing seven seconds in arrears. In the race from Long Bay Beach on Beef Island, to the airport and down to Little Mountain before heading over a slight climb, then entering the beach and running at the water’s edge, Farley said he made his move over Stoby during the latter stage of the race. Women’s winner Katrina Lindsay had a busy day. Following the race, she headed into town to run the 800-meters in the Dag Samuels Development Series. Lindsay who anchored her team with a 10-miles leg during the KPMG Tortola Torture, said she felt good running last week and was hoping to go out and run well on Saturday. “I wasn’t sure if I’d have any fatigue still in my legs from last week, but that didn’t seem to be a problem,” she noted. Top finishers. Men: 1. Julius Farley, 18 minutes and 18 seconds. 2. Reuben Stoby, 18:25. 3. Paul Mellor, 18:56. 4. Dan Mitchell, 19:59. 5. Derek Rawlins, 20:09. 6. Zebalon McLean, 21:34. 7. Marcus Hallan, 21:47. 8. Claudius Rymer,22:36. 9. Shane Donovan, 22:44. 10. Sergio Dantas, 22:54. Women: 1. Katrina Lindsay, 21:39. 2. Kim Struiken, 22:05; 3. Kay Reddy, 25:27. 4. Saungie Liburd, 22:50. 5. Darwn Peters, 26:19. 6. Anna Kinkead, 27:53. 7. Kerry-Ann Dos Santos, 28:02. 8. Natasha Ruscheinski, 28:20. 9. Florence Ormond, 30:50. 10. Mary Ormond, 30:50.